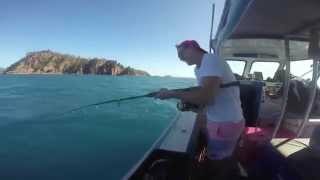 Whitsunday Fishing Charters is the longest established outer island and outer Great Barrier Reef fishing charter in the Whitsundays! Half and full day charters depart daily from Abel Point Marina in Airlie Beach. Jump aboard the Reel Deal, a 7.5 metre custom charter boat and Reef Adventurer, a 12 metre custom charter boat and enjoy a fast and comfortable ride out to the best fishing grounds in the beautiful Whitsunday Islands and Great Barrier Reef. Target species include Coral Trout, Red Throat Emperor, Red Emperor, Spangled Emperor, Nannygai, Cod, Spanish Mackerel, Trevally, Tuna, Cobia and many more reef and pelagic species. Full day to the outer Great Barrier Reef- 7am to 4:30pm. Included are the use of quality rods and reels, handlines and tackle, bait (live, strip, lures), morning tea/afternoon tea, catch cleaned and put on ice, free pick up and drop offs, onboard amenities. They also offer the opportunity for your fish to be cooked fresh that day at FishD’Vine, the local fish and rum bar for the low cost of AUD8.50.